The California Supreme Court recently loosened restrictions on the ability of non-locally licensed in-house counsel to engage in pro bono legal services, effective March 1, 2019. Corporate Pro Bono (CPBO) and the Association of Corporate Counsel (ACC) worked to advocate for amendments to the California Rules of Court and the State Bar Rules that would remove burdensome restrictions on pro bono practice for in-house counsel. Approximately three dozen Chief Legal Officers (CLOs) signed onto letters in support of the rule change. Prior to the amendments, in order to practice pro bono, non-locally licensed, registered in-house counsel were required to additionally register as Legal Services Attorneys and restricted to providing pro bono services for only a single qualifying provider for a maximum of three years. These limitations presented a significant barrier to many California in-house counsel from engaging in pro bono and ran counter to the state bar’s commitment to bridge the justice gap. While California did not go as far as the four states with model rules (Illinois, New York, Virginia, and Wisconsin) in eliminating all unnecessary restrictions on non-locally licensed registered in-house counsel from practicing pro bono, the amendments are a welcome change in a state with singularly strict rules. The Programs Committee of the Board of Trustees of the California State Bar took up the issue in 2018, proposing amendments to ease the restrictions. The issue went before the full Board in the fall of 2018, which sought public comments on the proposed rules. On December 12, 2018, the State Bar of California filed a petition with the California Supreme Court proposing the revisions. Just over two months later, on February 22, 2019, the Supreme Court approved adoption of the proposed amendments. The amendments do away with the Legal Services Attorney dual registration requirement and the time limit on providing pro bono services. Under the amended rules, in-house counsel are not limited to providing pro bono through a single legal aid organization, although counsel must submit a supplemental form identifying the legal aid organizations and the supervising attorney. Additionally, registered in-house counsel may provide pro bono services through either eligible legal aid organizations or the qualifying institution that employs him or her. A unique feature of California’s new rule permits in-house counsel to provide pro bono services through their employer’s pro bono program. This aspect of the rule builds in flexibility for in-house counsel who are participating in pro bono work under the auspices of their legal department’s pro bono program, which may offer a variety of engagements throughout the year. It is a worthwhile feature to consider for states seeking to ensure accountability for pro bono services, which can come from the institution employing in-house counsel as well as from a legal aid organization. The PBEye congratulates all involved in bringing about this rule change in California, which should pave the way for increased in-house pro bono and improve access to justice. Interested in learning more about which states authorize in-house attorneys to do pro bono and other rules governing pro bono practice? 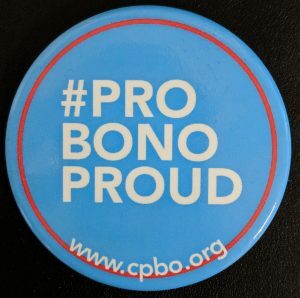 CPBO offers many helpful resources on the right to practice pro bono, including an interactive map with state-by-state information about pro bono practice rules, a Guide to In-House Pro Bono Multijurisdictional Practice Rules, and an infographic on the Right to Practice. CPBO also offers a Guide to Select Rules for Pro Bono Practice that provides a state-by-state view of pro bono rules governing limited scope representation, CLE for pro bono, out-of-state and emeritus attorneys, among others. If you have questions about the rules in your jurisdiction, please contact CPBO Director Tammy Sun. Ready to learn about the latest trends in in-house pro bono? Corporate Pro Bono’s 2018 Benchmarking Report is hot off the press! Since 2010, CPBO’s biennial benchmarking survey highlights key trends in in-house pro bono and enables legal departments to compare the performance and management of their pro bono programs with those of other departments. Historically, the survey always covers topics such as program administration, policies, insurance, partnerships, projects, global pro bono, metrics, communications, and budgets. For the 2018 Benchmarking Report, CPBO also incorporated new questions in the survey we sent to in-house legal departments that included questions about dedicated pro bono managers, the tools departments use to track metrics, and strategies to encourage pro bono participation. There were several new trends on which CPBO focused this year. One emerging trend is the growing interest in measuring in-house pro bono and the variety of tools that legal departments are using to track this data. CPBO found that spreadsheets are the most popular tool for pro bono metrics, followed by use of document management software and Corporate Social Responsibility (CSR) platforms or software. CPBO will explore metrics in further depth during the In-House concurrent program “Measuring Up: Evaluating Your Pro Bono Program” at PBI’s 2019 Annual Conference, which will feature several examples of pro bono metrics tools, including an overview of the tools and measurements used, exploring the value of what is measured, and sharing how legal departments utilize data to advance their pro bono programs. Additionally, the 2018 Benchmarking Report reveals that there has been a steady growth in the use of certain tools and strategies to demonstrate the importance of pro bono within legal departments. Among these tools, recognizing pro bono participation at department meetings has risen markedly among respondents, from 36 percent in 2012 to 73 percent in 2018. Similarly, more departments are using awards and newsletters to recognize pro bono volunteers. These trends indicate not just growing appreciation for pro bono volunteers but also the increased value that departments place on pro bono. To learn more about the 2018 Benchmarking Report or in-house pro bono, please contact CPBO at cpbo@probonoinst.org. Many companies have successfully engaged professional staff and employees outside the legal department in legal pro bono services and have done so in different ways. CPBO’s 2016 Benchmarking Report reported that professional staff participate in 92% of in-house pro bono programs. Depending on the company and its pro bono culture, there are a variety of short-term or long-term pro bono engagements that can engage staff. Some companies select opportunities that are legal in nature but do not require a lawyer to complete the task, such as intake clinics, while others structure opportunities that contemplate involvement of their professionals and staff working in partnership and under the supervision of a lawyer. The paper offers concrete examples of how various legal departments have expanded engagement to involve legal department professionals and staff, and attorneys and professionals outside the legal department. United Health Group** is an example of a legal department that created a project involving lawyers and legal department professionals alike to provide limited-scope pro bono assistance to review medical and military files for veterans seeking benefits. Dentsu Aegis Network** exemplifies another model of engagement in which the legal department engaged employees outside of the department in marketing, communications, and public relations to work on an initiative connecting communities to appropriate legal services. The paper details many more examples of pro bono projects engaging professionals both within and outside the legal department. In order for any expanded engagement to succeed, the company should consider some key issues to ensure success. For example, does the company have a clearly-stated policy that any employee can engage in pro bono? Does the company have malpractice insurance for pro bono matters that covers professional staff and attorneys who work in other departments? Does the company have appropriate supervision for professionals and staff to prevent the unauthorized practice of law? The pro bono chair or committee can take the initiative in helping the company examine questions such as these. CPBO offers many resources to help on these topics, including a Guide to Professional Liability Insurance for In-House Pro Bono, FAQs for pro bono policies, and a Guide to In-House Pro Bono Multijurisdictional Practice Rules. The paper also discusses key issues for consideration, such as training and recognition, as well as solutions to common challenges. Broadening engagement benefits both the community and the company. Broadening the pool of pro bono volunteers creates benefits for all those involved. It benefits the company by promoting employee engagement, reinforces corporate social responsibility objectives, builds relationships among employees who do not ordinarily work together, and enhances the reputation of the company. By encouraging lawyers and staff to work in teams, pro bono service builds morale and sustains continuing interest in pro bono engagement. Broadening engagement also means that a company can have a greater impact in serving communities that cannot afford legal assistance. With a deeper bench of volunteers, a company can serve greater numbers of pro bono clients and take on broader access to justice initiatives more efficiently and effectively than if participation were limited to legal department attorneys. 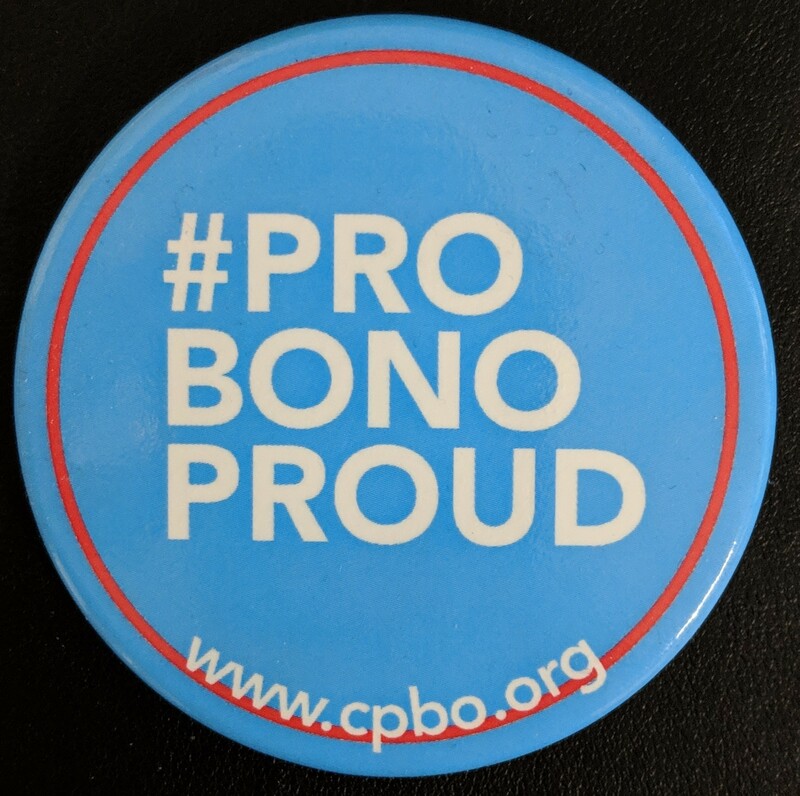 To learn more about expanding a legal department’s pro bono program to include paralegals, support staff, and attorneys and professionals outside the legal department, read CPBO’s new paper here. As we recover from another holiday season full of celebratory meals and parties, many of us are re-committing to healthy eating. Healthy eating, however, isn’t always just a matter of choice (or willpower)! 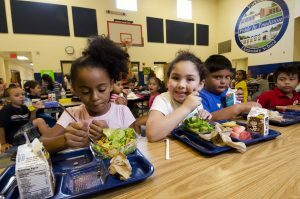 In an era of high food prices and food deserts, sustainable access to nutrition in low-income communities has become a heightened concern. The epidemic of diet-related diseases such as diabetes and obesity points to the urgent need for food justice and improving access to nutritious food. Although programs such as public assistance benefits exist, many eligible individuals and families do not have access to the limited assistance available or cannot make effective use of them, especially if they live in a rural area or a food desert. Pro bono lawyers can substantially improve food access by tackling projects at global, national, state, local, or individual levels. There are a range of pro bono oppor tunities, for litigators and transactional lawyers alike. Potential projects vary in size and complexity, offering options that fit the needs and interests of diverse pro bono lawyers. Moreover, law firms and legal departments may be in a position to align this type of pro bono work with already existing community service projects, such as ones targeted at schools, children, or families. 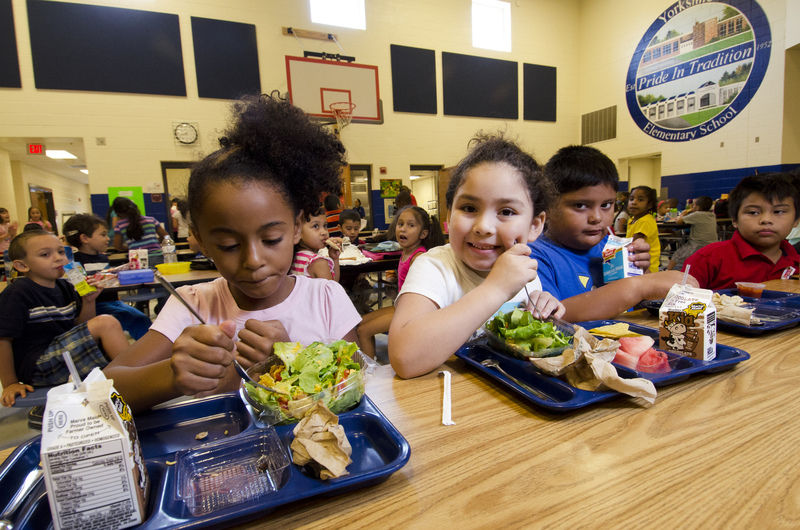 Increasing access to healthy food and fighting hunger are objectives that enjoy broad support. Because many people – not just foodies – feel strongly about these goals, you may be able to excite and engage attorneys, some of whom may not have previously been the most active pro bono participants. Pro bono lawyers play a pivotal role in the process of eliminating health disparities in disadvantaged communities and improving access to nutrition in a variety of ways. Examples of pro bono opportunities that increase food accessibility and tackle legal challenges associated with structural food injustice include: providing legal services to organizations and programs that aim to eliminate food inaccessibility, direct advocacy for legislative and policy change, partnering with existing organizations to initiate or expand food-related programs, and more. Although the fight for access to nutrition is often more than a legal battle, there are meaningful pro bono opportunities available. One entry point of involvement is providing legal services and representation to nonprofit organizations with missions centered on tackling food injustice and promoting nutritious food accessibility. For example, Alston & Bird*† represented FamilyCook Productions by reviewing the organization’s employment policies and assisting with the structure of their license agreement, enabling the nonprofit to further expand their programs and serve more than 100,000 people. In addition to their work establishing the Global FoodBanking Network, DLA Piper*† provides legal services to Feeding America and numerous other food banks. Similarly, Armstrong Teasdale*† represents The Link Market, an organization that operates in prominent food desert St. Louis, Missouri to establish quality grocery stores in accessible locations along the city metro line and works directly with local farmers and g ardens to ensure local, fresh, nutritious foods are sold at the grocery markets. Brown Rudnick*† and Greenberg Traurig*† provided pro bono legal services to Community Servings as they constructed their Food Campus, which will allow the organization to triple its production of food for those who are in need of special dietary meals. Partnering and working directly with already existing organizations whose missions are aligned with food accessibility is another meaningful way lawyers are making a difference. Ballard Spahr*† has worked with The Common Market, a nonprofit organization that aims to manage the supply chain between local, sustainable food producers and inner-city communities, as well as cultivates family farms and markets products to local institutional buyers such as hospitals and schools. 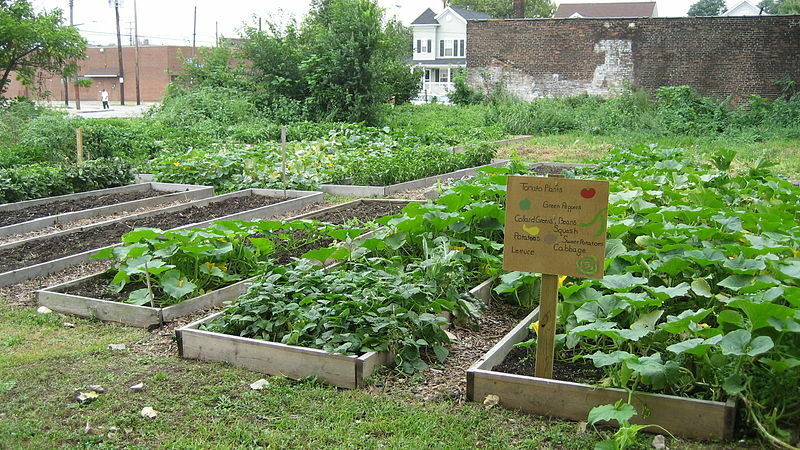 Firm lawyers assisted the organization’s expansion by establishing similar programs in other states to promote accessibility to fresh, nutritious, and sustainable food in local institutions and inner-city markets. McDermott Will & Emery*† conducted legal research and worked with The Medical Legal Partnership for Children to publish a report, Food Stamps and Immigrant Families. A number of legal services organizations and pro bono providers are entering this space and crafting meaningful pro bono opportunities. For example, the Conservation Law Project in Massachusetts created its Legal Food Hub to connect those involved in the farming and food production industries to pro bono lawyers. With its goal of helping the local, sustainable food system, the Legal Food Hub offers assistance to eligible farmers, food entrepreneurs, and farm/food-related organizations in New England with legal issues such as land acquisition/transfer, estate issues, taxes, contracts, and corporation formation. Pro bono lawyers can bring significant changes to low-income communities, ensuring that everyone has the ability to live a healthy life free from hunger. To learn more about opportunities and examples of pro bono work addressing access to nutrition, check out the Law Firm Pro Bono Project’s publication, Pro Bono Food for Thought: Improving Access to Nutrition, and our podcast, the Pro Bono Happy Hour (specifically the episodes featuring Scott Hunt of Armstrong Teasdale and Congresswoman Mary Gay Scanlon, formerly of Ballard Spahr). Hat tip to PBI intern Hiba Said for her help with this post. There are many people who would like to do pro bono, but then have excuses at the ready for why it’s not the right time or opportunity. Sometimes, even when our hearts are in the right place, we need to change our way of thinking to spur a change in action. 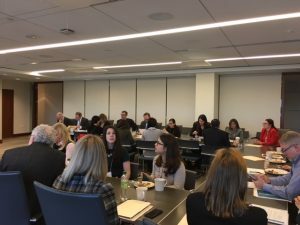 At an attorney all-hands meeting in October 2018, Comcast NBCUniversal** (“Comcast”) tackled head-on the issue of incentivizing pro bono engagement. The pro bono session at the offsite meeting, which assembled approximately 250 attorneys from across Comcast’s global offices, featured a discussion about Comcast’s pro bono program and explored different ways to elevate pro bono engagement. Public expressions of pro bono support from the executive management is often an effective way to motivate pro bono engagement. At the Comcast meeting, the company’s general counsel, Arthur Block, announced that Comcast had joined the Corporate Pro Bono Challenge® initiative, pledging to encourage at least half of their legal staff to support and participate in pro bono service. For those on the fence about participating, it helps to know that leadership is on board and values the use of company time for pro bono. Several leaders in the legal department shared their personal experiences with pro bono work, which included overturning the conviction of a wrongfully accused client and sharing his first night of freedom, and obtaining a green card for a child who fled persecution. This kind of storytelling has the power to shape decision-making by inspiring and illustrating the impact an individual can make through pro bono service. Comcast also organized a panel discussion to talk about the importance of pro bono for serving communities in need and the barriers to pro bono service. One of the panelists, Syon Bhanot, a behavioral economics professor, shared his research on why people do pro bono and how to get people to do more of it. Bhanot talked about a common impediment to volunteering called “present bias,” in which individuals often feel they are too busy at any given moment to take on a pro bono project. To overcome this bias, Bhanot’s tip is to afford people the opportunity to sign up for a pro bono opportunity far into the future and encourage them to block it off on their calendar. In behavioral economics terms, carving out time for future engagement is a “commitment device” that helps to modify incentives and achieve change in behavior. Bhanot also addressed the “free-rider temptation.” Some people may think that their participation in pro bono is unnecessary because enough of their colleagues are doing pro bono. To counteract this phenomenon, Bhanot suggests leveraging reputation by playing into the human desire to demonstrate “prosocial” behavior that benefits others. Just as giving out “I voted” stickers can motivate citizens to cast their ballots on Election Day, handing out “I did pro bono” buttons or ribbons can create the prosocial incentive to engage. Another challenge Bhanot discussed is the problem of “inattention,” which occurs when people do not pay heed to an issue despite its critical importance. The behavioral economics solution is to increase the salience and visibility of the problem so that it cannot be ignored. Bhanot discussed an example of an intervention in a sick population in Kenya. Despite serious illness, the community was not complying with taking their life-saving medications. Researchers devised a mobile phone app that sent text messages to patients reminding them to take their medicines. If the patients did not respond that they had taken their medicine, then the intervention escalated and they received a phone call reminding them of the benefits of taking the medicine. This intervention significantly lowered the rate of medication noncompliance and saved lives. Translating this example to the pro bono context, Bhanot encouraged companies and law firms to make it harder for volunteers to ignore the need for legal services by shining more light on the lack of legal services for low-income communities. As part of the panel discussion, Eve Runyon, the President and CEO of Pro Bono Institute, discussed the need for pro bono legal services to close the justice gap. Runyon shared some of the findings from the Legal Services Corporation (LSC) June 2017 report, including that more than 60 million Americans have family incomes at or below 125% of the federal poverty line, and that more than 86% of the civil legal problems reported by these low-income Americans receive inadequate or no legal help. Moreover, in 2017, low-income Americans approached LSC-funded legal aid organizations with approximately 1.7 million legal problems, more than half of which were turned away due to lack of resources. Knowing these facts about the scope of the unmet need for legal services increases the likelihood that pro bono volunteers will sign up to help. One additional way to “nudge” behavior to improve pro bono engagement levels is to help potential volunteers reconnect with their passion. Bhanot discussed how many attorneys went to law school because they wanted to help people, but their day-to-day legal practice may feel removed from this goal. By tapping into and reminding volunteers of the passion that ignited their legal studies long ago, they are more likely to seek out opportunities to help others. Sharing stories of how pro bono volunteers made a difference in their work is an effective and visceral way to remind people how they can help. To learn more about how to use behavioral science to encourage pro bono engagement, join us at PBI’s 2019 Annual Conference, where Professor Bhanot will be speaking on motivating pro bono engagement. To learn more about how all-hands days can have a positive impact on your company’s pro bono program, review CPBO’s recently-released paper on Incorporating Pro Bono Into In-House All-Hands Meetings here or contact CPBO at cpbo@probonoinst.org. For more information about the Corporate Pro Bono Challenge® initiative, click here. Housing is a fundamental human right, yet the United States does not guarantee a right to counsel for individuals fighting to protect the roof over their heads. This means low-income tenants face a high risk of unfavorable outcomes in housing court, including wrongful evictions, simply because they are ill-equipped to defend themselves in eviction proceedings. In several jurisdictions, advocates are organizing to improve the status quo by securing a right to counsel in housing eviction cases. These efforts present unique opportunities for pro bono lawyers. New York. In New York City, there are 230,000 eviction cases or other proceedings brought against tenants annually. Historically, less than one percent of tenants have counsel while more than 90 percent of landlords are represented. Following an initiative that brought a significant increase in annual funding for legal services for tenants, the percentage of represented tenants in eviction cases increased from one percent in 2013 to 27 percent in 2016, and the eviction rate dropped by 24 percent from 2013 to 2015, according to the New York City Office of Civil Justice. This initiative served as a precursor, bolstering longtime efforts by a broad coalition in New York to advocate for right to counsel legislation. On August 11, 2017, New York City passed a law providing that at the end of five years, all income-eligible tenants (residents whose income is 200 percent of the federal poverty level or less) will be guaranteed legal representation in eviction cases. The city is rolling out the right to counsel by zip code. Pro bono attorneys helped draft the law, advocate for its passage, and research legal questions for the Right to Counsel NYC Coalition, such as whether the city had authority to implement a right to counsel without infringing on the authority of the courts or the state. San Francisco. In 2012, less than 10 percent of tenants in San Francisco were represented in eviction cases. That same year, the city passed its Right to Counsel in Civil Matters Ordinance, declaring San Francisco a “Right to Counsel City,” and authorizing a one-year Right to Civil Counsel Pilot Program, implemented by the Justice & Diversity Center (JDC) of the Bar Association of San Francisco, to train pro bono attorneys to provide full-scope representation for tenants in eviction cases. The Pilot Program, which ran from October 2012 to September 2013, increased the representation of indigent tenants in eviction cases and provided critical data to support a right to counsel by showing that tenants are less likely to be evicted when they receive full-scope representation in housing court. On June 5, 2018, the city passed a ballot initiative, creating a taxpayer-funded right to counsel for all tenants in eviction cases with no income-eligibility threshold, and giving the city one year to determine how to implement the measure, which would expand legal services for tenants. In addition, JDC’s Homeless Advocacy Project continues to offer pro bono volunteers opportunities to help clients fight eviction proceedings, among other services. District of Columbia. According to the DC Bar Foundation, there are more than 30,000 eviction cases each year in Washington, D.C. and, historically, only 10 percent of tenants in those cases have representation compared to 90 percent of landlords. In 2015, a collaborative of law firms and legal services organizations created a Housing Right to Counsel Project, which trains pro bono attorneys to provide legal representation to tenants in eviction cases involving subsidized housing. A year later, the D.C. Council introduced a bill to establish right to counsel projects that would expand representation in eviction cases. In July 2017, the D.C. Council approved the bill and allocated $4.5 million to fund representation in civil cases involving fundamental human needs, including housing. In addition to staffing the Housing Right to Counsel Project, pro bono attorneys have played an important role, including representing indigent clients in housing matters through the D.C. Bar Pro Bono Center’s Advocacy and Justice Clinic, and providing same-day legal information to pro se parties at the Landlord Tenant Resource Center in D.C. Superior Court. Philadelphia. In Philadelphia, approximately 24,000 evictions are filed annually, in which only eight percent of tenants are represented, compared to 81 percent of landlords, according to Community Legal Services (CLS). In June 2017, the Philadelphia City Council held a hearing on the right to counsel in housing, resulting in the mayor launching the Philadelphia Eviction Prevention Project in January 2018 and boosting funding for landlord-tenant reforms, including legal representation in housing court, to $850,000 in July 2018. CLS leads a team of legal services organizations in implementing the Project, including staffing the Landlord Tenant Help Center at the Philadelphia Municipal Court up to 40 hours a week, funding a court navigator to direct litigants through the court process, and staffing a tenant hotline, among other services. Pro bono attorneys conduct intakes and provide limited scope representation to tenants through the Lawyer for the Day program, and take case referrals from the Landlord Tenant Help Center through Philadelphia VIP. Pro bono attorneys also have helped to work on reforms to Philadelphia Municipal Court Procedures and to conduct research on other issues relating to the right to counsel. Newark. In Essex County (which includes Newark, NJ) there are approximately 40,000 eviction cases annually, in which most landlords are represented, but 99 percent of tenants are unrepresented, according to the Lowenstein Center for the Public Interest. In July 2018, the law firm McCarter & English* announced a partnership with the city of Newark creating a pro bono program to represent tenants in housing court. A month later, the City Council approved an ordinance to create a nonprofit to provide legal representation to tenants facing eviction whose income is 200 percent of the federal poverty line or less, with a focus initially on seniors, the disabled, and undocumented residents, although the ordinance does not provide funding or details about the nonprofit. Through the McCarter & English program, to be run by a fellow, law firm attorneys will take on pro bono engagements while partnering with legal services organizations to represent low-income tenants in eviction proceedings. According to the National Coalition for a Civil Right to Counsel, “Having a lawyer can make the difference between keeping a home or losing it.” When people lose their homes, the adverse ripple effects on their health, education, employment, and the security of their families can be profound. Every individual and family who loses their housing results in social and economic costs for the community, including increased homelessness and use of public shelters and benefits. National Coalition for a Civil Right to Counsel, which highlights right to counsel movements across the United States. With its eighth annual Clinic in a Box® program this month, the “dream team” of the Association of Corporate Counsel Northeast Chapter (ACC-Northeast), Mintz Levin Cohn Ferris Glovsky and Popeo*†, and The Lawyers Clearinghouse, in partnership with Corporate Pro Bono (CPBO), have transformed transactional pro bono opportunities for in-house counsel in the Boston Area and made easier some common challenges of engaging corporate lawyers in pro bono. For many years, the partnership hosted an annual Clinic in a Box® program – Legal Audit, CPBO’s licensed off-the-shelf model designed to provide in-house counsel the opportunity to advise nonprofit organizations or small businesses in five areas of law: governance, employment, intellectual property, real estate, and tax. As part of the clinic, volunteers conduct a “check-up” to assess the legal needs of the nonprofit or small business in each of these areas. The goals of the clinic are to introduce legal departments and ACC chapters to a replicable pro bono delivery model; encourage in-house attorneys to use their transactional legal skills to do pro bono work in their communities; leave in-house counsel with tools they can use to continue to provide pro bono services on their own; and foster closer ties among corporations, law firms, public interest groups, and their communities. 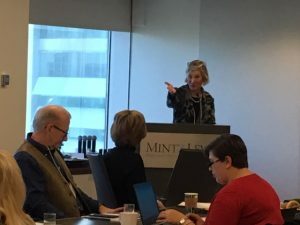 “We’ve been able to host hundreds of in-house counsel over the past several years, many of whom come back every year to help,” said Susan Finegan, Chair of the Pro Bono Committee at Mintz Levin. In 2014, after many years of hosting a Legal Audit clinic, the dream team decided to take its work to the next level. The co-hosts sought to address a common barrier many companies face in the evolution of transactional pro bono: keeping volunteers engaged, providing opportunities to a variety of volunteers with different skills and interests, and addressing the evolving needs of local nonprofit clients. To solve this challenge, the partnership worked with CPBO to create a new model of the clinic: Clinic in a Box® program – Select Topic, which focuses on a particular subject matter identified by the host organizations that volunteers receive training on and assist nonprofit clients in counseling and drafting a policy related to the topic in the course of the clinic. Past topics have included employment policies, bylaws, social media policies, privacy policies, and anti-harassment and nondiscrimination policies. Thanks to the pioneering work of ACC-Northeast, Mintz Levin, and The Lawyers Clearinghouse, the Select Topic clinic has allowed in-house volunteers to do meaningful pro bono work by focusing in-depth on specific legal areas relevant to nonprofit organizations or small businesses in their communities. Just as in the Legal Audit model, during the first half of a Select Topic clinic, expert attorneys from a law firm provide training to the volunteers. Armed with the necessary information, volunteers then split into teams to meet with representatives of local nonprofit organizations or small businesses to review checklists regarding the policies, revise existing polices and draft new policies, depending upon the clients’ needs. The Select Topic model has created more opportunities for volunteers and has served a variety of needs of local nonprofits and small businesses. In the Select Topic clinic held this month, Mintz Levin attorneys trained approximately 40 in-house lawyers and legal department professionals affiliated with ACC-Northeast about anti-harassment and nondiscrimination policies. During the second half of the clinic, volunteers met in small teams with 12 nonprofit clients to review and revise their policies. Clients left the clinic with a policy that they can immediately begin implementing in their organizations, and volunteers left in the holiday spirit, feeling a sense of accomplishment at helping nonprofit clients with much-needed legal services. CPBO congratulates the dream team on another successful clinic and looks forward to working with them again in the years to come. To learn more about CPBO’s Clinic in a Box® program, review our website and license options. To request a clinic in 2019, please submit this form. For more about ACC-Northeast’s pro bono program, review the In-House Pro Bono in Practice Profile here. Happy Holidays! Finding the perfect gift for that special someone can be quite the obstacle. Fortunately, PBI is here to help once again with gift ideas that give back to those in need. Need a gift for your favorite athlete or sneaker head? Check out Bombas Socks. After learning that socks are the most requested clothing items at shelters, Bombas knew they wanted to do something for their community. For every pair of socks purchased, the company donates a specially engineered pair of socks to someone in need; to date, they have donated more than 12 million pairs. Making sure we treat our body with the best natural products is an important and research-heavy task. Thistle Farms offers natural and high-quality bath, body, and home products that are hand-crafted by women who have survived trafficking, prostitution, or addiction. Every purchase directly supports the survivors. Know someone who has a major case of wanderlust? Take a look at Adventurist Backpack Co. For every one of the company’s stylish and functional backpacks sold, 25 meals are donated to families in need across the United States. Toys and dolls are always popular with the young ones in your life. Kind Culture Co. has created various dolls that give back in a multitude of ways. In addition to donating to several children-centered charities, for every doll purchased from The Doll Kind line, a doll is donated to a child in need and a portion of sales of the Good Deed Fairies line is donated to anti-bullying organizations. In addition to these ideas, we always suggest doing more pro bono work – sometimes the best gifts you can give someone are your time and talents! There has been growing interest among legal departments in collaborating with colleagues beyond the legal department in their pro bono efforts. Some departments want to increase impact by broadening participation by their colleagues outside the department and demonstrate the value of pro bono for their companies. Other legal departments seek to deepen their pro bono program by aligning pro bono work with wider company priorities and leveraging skills and expertise across the company to tackle critical access to justice issues. We invited Miri Miller, Associate General Counsel and global pro bono program lead at Dentsu Aegis Network**, to share how her legal department decided to take an expansive approach early in its pro bono program to align with the company’s corporate social responsibility strategy. At Dentsu Aegis Network, we are working to close the access to justice gap by devoting our legal skills to pro bono clients through our global legal pro bono program, and by leveraging non-legal employees’ creative, media, marketing, project management, data, and analytics skills to drive awareness of legal rights and sources of pro bono legal assistance. Because Dentsu Aegis Network is a multinational media and digital marketing communications company, we believe we have a responsibility to share our marketing communications skills to improve access to justice. Dentsu Aegis Network’s legal pro bono program is fairly new. We spent the first half of 2017 designing the program and establishing partnerships with pro bono providers and law firm partners, and formally launched the program during that summer. The program came into its own in early 2018 because our legal pro bono ramp-up (and internal marketing to build engagement) coincided with Dentsu Aegis Network’s publication of The Digital Society Index, a report about how new digital technologies impact people’s optimism about the future. The economy is evolving into a “digital economy” because every industry is being transformed by technology and connectivity. This transformation is disrupting how businesses operate, how employees perform their job functions, and how consumers obtain information, goods and services. The Digital Society Index is the result of a survey conducted by Dentsu Aegis Network, in partnership with Oxford Economics, of 20,000 people around the world to understand how they feel about the future in light of the digital transformations taking shape. The Digital Society Index pinpointed that distrust (due to insufficient transparency) and inequality (namely, a widening of skills gaps among socio-economic groups) are major issues that prevent disadvantaged communities from adapting to the new digital economy. Dentsu Aegis Network consequently pivoted its Corporate Social Responsibility (CSR) strategy to help ensure that no one is left behind as the economy transforms. A key pillar of this CSR strategy is that all employees should use their professional skills for good through skills-based volunteering, predominantly through projects aimed at remedying inequality by teaching new digital skills to disadvantaged communities, particularly youth, and by providing free marketing communications services to non-profits working to further similar objectives. What does that have to do with access to justice? Millions of people currently lack equitable access to legal aid. Among the most significant reasons for this access to justice gap is because people don’t know their rights, and even when they do, they are unable to find and connect to affordable or free legal services. We believe that when people know their legal rights and understand they will have access to legal aid when needed, they will place more trust in the system and be willing to participate more ambitiously in the digital economy. As a result, we bridged our legal pro bono program with Dentsu Aegis Network’s global CSR objectives, recognizing the value of engaging colleagues outside the legal department to improve access to justice. We reshaped our pro bono program with collaboration as a main objective to create relevant and meaningful pro bono projects for our legal team, as well as for non-legal colleagues across the Dentsu Aegis Network. Aligning our pro bono program with the global corporate CSR objectives affords us several benefits, including: harnessing collective enthusiasm across all volunteers, legal and non-legal, based on shared goals; a deeper willingness by senior executives to collaborate on pro bono initiatives because we are helping them further their own teams’ CSR goals; and hands-on support from the company’s CSR personnel. It helps enormously that our Group General Counsel, Simon Zinger, is deeply passionate about pro bono and CSR, and recognizes that doing pro bono work allows lawyers to develop and use “leadership skills to pursue and achieve positive change across some of the most essential pillars of a modern and humane society.” His commitment to making our pro bono program a success is a key driver of business executive buy-in of our vision of expanding legal pro bono efforts outside of our legal department. If you think employees outside of the legal department will be uninterested in contributing to access to justice and legal pro bono matters, think again. Civic engagement has increased in recent years. People actively seek ways to contribute to local communities and personal causes. They patronize businesses that have heart. They want to work for companies that allow them to undertake skills-based volunteering with measurable impacts on society. For many, equitable access to justice, regardless of socio-economic status, is a top-of-mind, meaningful cause. Survey your colleagues and I bet you’ll find many people who are enthusiastic about collaborating with the legal department to make a difference. Literally. Conduct a survey. I did! I found that many of my non-legal colleagues were eager to document their interest in working together and often followed up via email or phone call to learn specifics. I’m turning the survey results into a database of available volunteers willing to contribute their skills to pro bono matters. Just as Dentsu Aegis Network is deploying its wide-reaching communications, marketing, advertising, media and data resources to improve awareness of legal rights and sources of pro bono legal assistance, there are ways that any department can expand pro bono out of the legal department. Project Management: Many pro bono organizations are working with limited resources that must stretch further than ever expected. Great project managers can help pro bono providers improve their processes and organizational structures in order to become more efficient. Some of our pro bono work has involved helping non-profits improve legal and compliance policies. Non-legal colleagues have recently offered to help with reviewing and suggesting improvements to commercial and business practices and policies. Resource Development: Speaking of efficiency, pro bono providers often have fantastic documents, practice guidance, topical legal research and other such resources, but need assistance making them more user-friendly and sharable – or even turning them into self-help guides for people who are unable to secure counsel. Some of this work will require lawyers, but plenty of it won’t! Translation Services: Identify foreign language skills of colleagues outside the legal department. Interpreters are always in demand to assist with translation when working with pro bono clients from immigrant communities. Video calling and web-meeting technology means that interpreters may not need to be in the same location as the lawyers or clients. Interpreting services can become almost on demand! My survey-turned-database of volunteers included an inquiry about language skills so that we can pair volunteers based on translation needs, where appropriate. Research and training: Non-attorneys inside and outside the legal department can assist with non-legal research (e.g. country condition research for asylum matters), as well as preparation of guidance reports, training materials and other such tasks for which an artistic eye and mastery of presentation, publishing and video production are helpful. For example, a colleague in the UK conducted English and Spanish language country condition research in connection with US asylum work undertaken through, Kids In Need of Defense (KIND). Discoverability: Leverage internal marketing, communications and/or PR personnel to assist with access to justice awareness. In one of our earliest cross-department collaborations, a social media manager helped a legal aid organization develop social media marketing strategies aimed at increasing pro bono attorney volunteering in the aftermath of a natural disaster. More recently, we launched a large-scale initiative to leverage our employees’ marketing and communications skills to improve people’s knowledge of their legal rights and encourage more lawyers to do pro bono work in the aftermath of natural disasters and emergencies. We kicked off the program with an “IdeaJam Hackathon” that began with a presentation about disaster legal services and the challenges in educating communities and mobilizing lawyers. Participants were divided into six diverse teams. Each team included people from different agencies, seniority levels and departments (e.g. media planning, communications, data analysis, creative); The teams were given 24 hours to design innovative campaigns to improve the delivery of disaster legal services. The resulting work was stunningly creative! We are now developing plans to produce the results. To build excitement and a stronger sense of teamwork for this initiative, I branded the initiative as Ad2J to highlight the power of advertising to improve access to justice (A2J). Many resources from across the legal industry – and from outside of it – are needed in order to close the justice gap. By working with our colleagues outside of the legal department, we expect to exponentially increase our impact. To learn more about Dentsu Aegis Network’s pro bono program and collaborations, please email cpbo@probonoinst.org. Special thanks to Miri Miller for her contribution to this post. Opioids are a class of drugs used to reduce pain, ranging from prescription opioids such as oxycodone and morphine, to illegal opioids such as heroin. In the 1990s, healthcare providers began prescribing opioid pain relievers at increased rates, leading to the widespread misuse of prescription and non-prescription opioids. This resulted in a spike in addiction, amounting to 350,000 deaths between 1999 and 2016 from an overdose involving opioids. In 2017, the Health and Human Services (HHS) Acting Secretary declared a public health emergency to address this epidemic. Because of the alarming number of overdoses, efforts to mitigate the epidemic tend to focus on supporting healthcare providers, raising awareness about opioid misuse, and encouraging safe choices among consumers. While valuable, these endeavors bypass many of the immediate challenges faced by those suffering from addiction throughout the recovery process, as well as by their close friends and family members. As legal problems often go hand-in-hand with the slew of effects stemming from opioid addiction, there is an opening for pro bono attorneys to help combat the crisis and improve people’s lives. Other post-incarceration barriers to re-entry. People addicted to opioids and recovering from addiction are likely to encounter at least one – if not several – of these obstacles. The consequential hardships also affect friends and family, and result in accumulated burdens on the judicial system, healthcare centers, foster care system, and more. A multi-pronged approach is, therefore, needed to address the varying demands of the community. Medical-legal partnerships (MLPs) offer a practical continuum of legal assistance and support throughout the recovery process. MLPs are collaborative arrangements between legal professionals and healthcare organizations where attorneys are available on-site to assist eligible patients with needs that would otherwise not be addressed within the clinical setting. Over 300 health care organizations operate MLPs, with more currently in the planning stage. Therefore they are an established model that can be leveraged to provide more holistic services. A best practice is for patients to be screened for legal needs and referred for legal assistance as soon as they are admitted for opioid addiction treatment. Pro bono attorneys can help train medical professionals to identify common legal problems, while doctors can train attorneys and legal staff so that they better understand addiction and the recovery process. One optimal aspect of these partnerships is that pro bono attorneys reach out to patients, rather than the other way around, so attorneys assist patients with their specific needs and offer tailored solutions. This establishes a more client-centered process, one that is difficult to attain when performing discrete functions where clients contact attorneys for help with a specific matter. Through MLPs, pro bono attorneys are meaningfully involved in patients’ lives, as they work with medical staff to understand specific treatment plans and other personal information. This allows attorneys to better advocate for patients, particularly before those who have misconceptions about treatment for addiction. Attorneys can successfully explain that treatment plans are medical decisions made by doctors, not by judges. For example, one patient was pressured by a judge to wean off her treatment program, which combined therapy with replacement opioids to prevent withdrawal, because the judge viewed it as replacing one addiction with another. An MLP attorney informed the judge that ending treatment is a medical decision to be made solely by a doctor and argued that the patient’s recovery depended on the specific treatment plan. Ultimately, the judge changed her mind and allowed treatment to continue. Employment is also an important area where pro bono attorneys can be of help. Patients may not realize that barriers to future employment have legal solutions, or that termination from their job could be illegal. For instance, one employee tested positive for methadone, a prescribed replacement opioid, and her employer moved to terminate her. An MLP attorney informed the employer that they cannot not fire an employee for receiving legitimate medical treatment. Increasing opportunities for employment does not end with advocating for treatment plans; assisting in other areas, such as helping to seal criminal records will open doors for future opportunities as well. Both testimonials and research studies reveal the benefits of embedding legal assistance in medical facilities, particularly in settings like treatment centers, where patients have complicated legal histories. While MLPs have been in place for several decades, they have only recently begun focusing on substance use disorders (SUDs). As of September 2017, only four MLPs (located in Cincinnati, Ohio; Indianapolis, Indiana; Portsmouth, Ohio; and Reno, Nevada) in the U.S. specifically focused on helping people with SUDs. While many partnerships with hospitals, health systems, and health centers exist across the U.S., pro bono work can continue to expand in this area with a focus on opioid addiction. Diversion programs, another experimental method of aiding recovery, mitigate the current mass incarceration problem in the United States and provide better resources to those battling addiction. Many different types of diversion programs exist; for example, drug courts act as alternatives to incarceration, where participants are transferred after pleading guilty to a drug-related crime. Through other diversion programs, participants are diverted at the point of arrest and enter the program instead of being charged with a crime. The average national completion rate for treatment courts is 60 percent, approximately two-thirds higher than probation. One such experimental court, the Opiate Crisis Intervention Court, is a judicially supervised triage program in Buffalo, New York that links participants with medication and behavioral treatments within hours of their arrest. Drug court participants have biweekly appearances before a judge, and they receive medication and residential treatment if needed, as well as random drug testing and other social services. They are incentivized with rewards, including the reduction of court costs and gift cards. These courts offer meaningful opportunities for pro bono attorneys to play a direct role in someone’s life. Drug court teams are typically comprised of a drug court judge, a prosecuting attorney, a defense attorney, a probation officer, treatment representatives, and a law enforcement representative. While the judge makes final determinations regarding a range of consequences, such as reduced supervision requirements, transfers to more intensive levels of care, or punitive sanctions, the drug court team meets in a collaborative setting to review each case and contribute information about participants’ progress. Because of individualized treatment plans and clinical needs, pro bono attorneys are able to advocate for patients by explaining specific information that may otherwise go unnoticed by the rest of the team. Whether it is through working in a drug court as part of a team, advocating for the expansion of similar programs, or helping funnel people into treatment centers early in the process, providing access to an attorney and representation is crucial in assisting recovering addicts. Assisting nonprofits that provide services to people affected by the opioid crisis with a variety of transactional matters, ranging from compliance with laws and regulations to advice regarding government grants and contracts. Combatting fraudulent treatment and recovery centers. 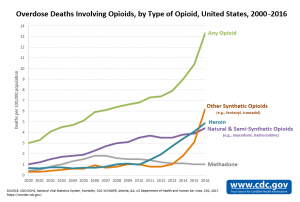 Much of the conversation surrounding the opioid crisis focuses on overdose-reversal drugs, medication-assisted treatment, and best policies for decreasing the number of people addicted to opioids. Sometimes, the “very basic things that could go a long way to accessing treatment and maintaining recovery” are forgotten. It is difficult for low-income patients to successfully recover if they don’t have basic necessities, such as housing, education, childcare, employment, or transportation, or if they face significant legal barriers to obtaining these necessities. Fulfilling these basic needs can be daunting on one’s own, and it is an area where pro bono attorneys can make a vast difference in someone’s life. There is an opportunity to suit the interests and talents of every pro bono lawyer. Hat tip to PBI intern Arlyn Upshaw for her help with this post.